Lauderhill Auto Body Shop - We are constantly on the lookout for new technology that will make your auto body repair experience in Broward County a fast and pleasant one without any of the hassles. We are constantly on the lookout for new technology that will make your auto body repair experience in Broward County a fast and pleasant one without any of the hassles. We are constantly on the lookout for new technology that will make your auto body repair experience in Broward County a fast and pleasant one without any of the hassles. All of our technicians are ASE certified. You can definitely trust us with your cars, because we are all car enthusiasts who will treat your car with the same devotion we give our own cars. Our commitment to your personal satisfaction is guaranteed. We will not stop until you are happy and safely back on the road with your mind at ease. 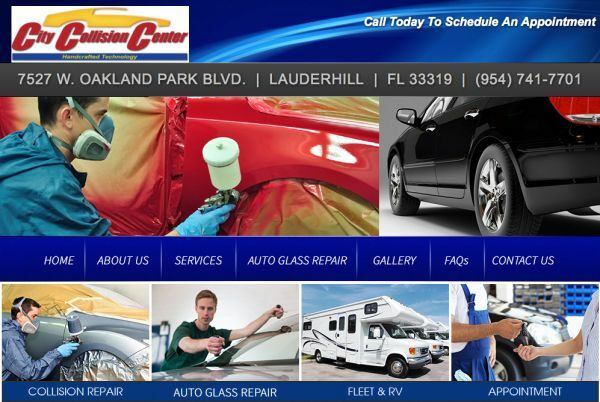 Whether you are in Lauderhill looking for an auto body shop or an auto collision repair center in Broward County, City Collision Center should be your first choice. When an individual is involved in an auto accident, the last thing in the world you need is more stress and hassle. City Collision Center is an auto body shop in Lauderhill, FL that provides full auto body service by ASE-certified professionals.